There is no "easy draw" at the NCAA Championships. All three of our crews faced tough heats, and all three shut down early to conserve energy for the rep, our true shot at the semi. We returned to the course in the afternoon determined to qualify or go down fighting. Off the line at 46, shifting to base 38 and battling the whole way down...the NCAAs taught us how to RACE. While no one was thrilled about missing the semis, beating Radcliffe for the first time this season was some consolation. On Sunday, the 1V gave the weekend's highlight by leading their final for the majority of the race and finishing 14th overall - ahead of their ranking, Wisconsin, and Oregon State. It's amazing how quickly the definition of success can change. True competitors will never be happy to just participate. After three years of striving to qualify the full squad for NCAAs, it took us one race to realize that getting there is no longer enough. Before we headed home, we took a moment to appreciate how far we've come. That moment was short-lived, because all the team could talk about was how to get faster. We are determined to get back to the championship, and get out of that third level final. Do we feel like it was a successful season? Yes. Are we satisfied? No. We returned to Camden just two weeks after Sprints, ready to make a mark and prove that Dartmouth belonged at the national championship. Sitting at the starting line was pretty surreal--after talking about NCAA's workout after workout throughout the winter and spring, it was crazy to actually be there!! Heats were somewhat disappointing--the 1V struggled with equipment malfunctions, but we all quickly realized that these races require a new level of intensity. Strangely enough, losing to crews like Clemson and Wisco made us believe that we could stick with them and even beat them. It was inspiring to race against the nation's fastest collegiate crews. We all got off the water after reps and finals feeling that we had our best races of the season. But what was really awesome to see was everyone's desire to come back next year and perform even better. We all went home with a summer training and lifting plan, and we've constructed a website to help everyone stay in touch and log workouts. We're not waiting until the fall to get started! Just about everything was different at the IRA this year. Getting there (Sacramento's Lake Natoma) meant boarding passes for the rowers and a 3,000 mile haul for the shells, and the cautionary tales from the area around the course warned against waking sleeping rattlesnakes instead of making bad turns into worse neighborhoods. And on the water, the regatta saw some of the most intense racing in its history. 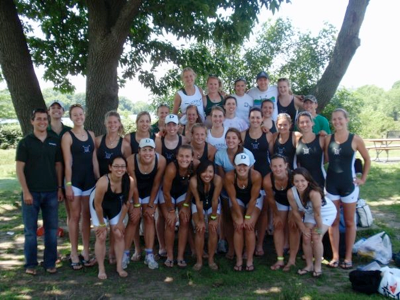 The Dartmouth crews contributed their share to that racing, as all three crews left Sacramento with reasons for pride. The varsity crew entered the regatta knowing that the Thursday rep would be the key race. We knew we were unlikely to qualify to the A/B semifinal through the heat, with Sprints gold and silver medalists Brown and Harvard likely having claim on the two advancing spots. But we thought that a great race in the rep would put us through to the A/B and a top 12 finish at the regatta, an unspoken goal heading into the weekend. With that in mind, the guys used the Thursday morning heat as a preparatory piece, shaking the rust off and rehearsing the elements that would make them successful in the afternoon. The afternoon rep pitted the guys against Penn, who we had beaten handily at Sprints, and George Washington, who had finished a little over a second ahead of us at Sprints, in ninth place. The winner would advance to the A/B semi. I told the crew that I suspected the race would come down to the second quarter-GW would lead us off the line, but if we could hang onto them and make a strong push in the second 500, I was confident they could successfully fight off George Washington over the final half. I suspected that the race would be close, certainly less than a length. Sometimes it's nice to be wrong. The Green caught up to a strong GW start by the 500 meter mark, and the guys took almost nine seats in that second quarter before walking away to win the rep by open water. Mission accomplished. Check that. The guys are competitors, and that showed on Friday and Saturday, where it became clear that just hanging with the country's top talent wasn't enough. Our semi put us into the petite final, where a shaky first 500 relegated us to the back of a pack that we couldn't rejoin, no matter what we threw at it. Forget the goal of making the A/B semi and the top 12--the guys were disappointed. As a coach, I was disappointed for them (though not in them), and quietly happy to see the thirst for more. I do hope that in time, the seniors especially realize that they've accomplished. They were 24th in 2007, 12th in 2009. No other crew has made a two-year jump that big. In the lower boats, the second varsity suffered an injury a few weeks before the trip that caused them to race a man down. I was pleased to see the crew race with tenacity, especially in their final race together, despite a disappointed 14th place result. The frosh had a solid rep to earn a spot in the petite final, where they also finished 6th. 12th is the best finish our frosh have had at the IRA in a few years--and a better finish than any of their classmates on the varsity, which I'm sure they won't fail to mention--so the future remains bright. A HUGE thank you to the parents and alums who kept our tent stocked with refreshment and inspiration throughout the weekend. Thank you all for making that happen. The heavyweights secured entries for the varsity, second varsity, and freshman eights at the IRA National Championship in Sacramento, CA. West coast alums, this is the first time in a long time we’ll be in your neck of the woods. Racing will run from June 4-6 at Lake Natoma just outside of Sacramento. The women earned a team bid to the NCAA Championship, thus becoming one of the rare groups of people excited to be headed back to Camden, NJ for the second time in tw weeks. NCAA racing runs from May 29-31. More to come as the dates approach.